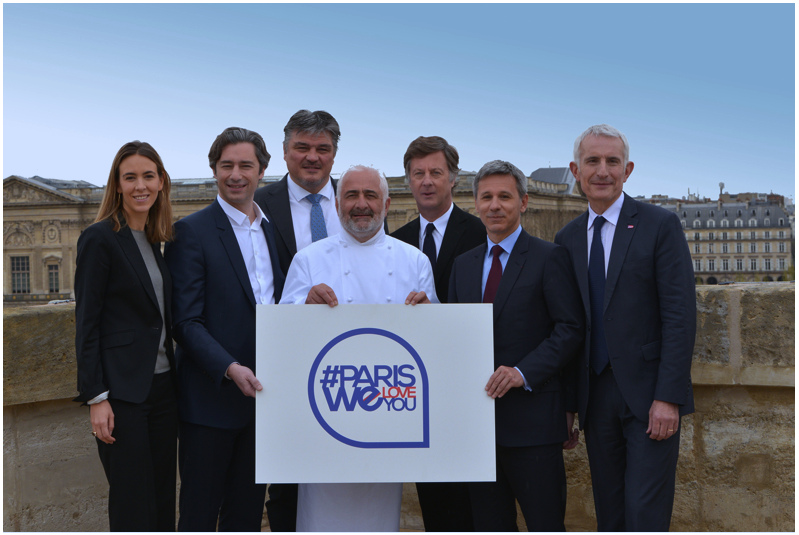 Today, AccorHotels, SNCF (French Rail) and Ile-de-France (Greater Paris) authorities are extending the #ParisWeLoveYou initiative they kicked off in the wake of the November 13th 2015 attacks with an international campaign to promote Greater Paris and give the region’s appeal a fresh boost for French and international tourists, backed by Galeries Lafayette, Facebook, Monnaie de Paris (Paris Mint) and Guy Savoy. Photo credit: A. Bommart. Left to tight: Alexandra van Weddingen (VP, Corporate Communications, Galeries Lafayette Group), Laurent Solly (CEO, Facebook France), David Douillet (VP, Ile-de-France Regional Council for international action and tourism), Guy Savoy (Chef), Sébastien Bazin (CEO, AccorHotels), Christophe Beaux (CEO, Monnaie de Paris), Guillaume Pepy (Chairman of the Board, SNCF). SNCF will offer French and international tourists over 220,000 discounted tickets on TGV, Intercités and international trips to Paris this spring and summer (e.g. €39 from London to Paris on Eurostar and €34 from Nantes to Paris by TGV). The Paris Ile-de-France Tourism Board will feature opportunities to enjoy the wide range of attractions in the region including Impressionist landmarks, family outings, the Seine’s banks, fine dining and more. From May 3rd to September 4th 2016, AccorHotels will provide up to 30% discounts on all-inclusive stays in 100,000 rooms on its AccorHotels.com and brand websites to treat tourists to an unrivalled experience in the Ville Lumière. These deals will be backed by an extensive media campaign in France and 14 other countries – and relayed by partners in more than 40 countries – starting April 4th. This joint campaign will feature selfies by tourists in Paris inviting their friends to come and enjoy everything the city and its environs have to offer (cultural attractions, gastronomy, lifestyle, shopping opportunities, etc.) under the #ParisWeLoveYou banner. A Selfie Race in and around Paris will also unfold on social media this May. This community digital operation will encourage the greatest possible number of Parisians and tourists to take selfies at the French capital’s most emblematic landmarks and to share them online to prompt the people they know to spend time here. An interactive map will list all the #ParisWeLoveYou-tagged selfies, track the best contributors in real time, and reward their commitment with prizes. “I’m very happy to join forces with SNCF, Greater Paris authorities and all our partners on this campaign to bolster Paris’ appeal and to help our city to keep its rank as the world’s number-one tourist destination,” added AccorHotels CEO Sébastien Bazin. “Greater Paris authorities are working side by side with the tourism industry to reinvigorate this vital sector, which has been struggling since the attacks. This campaign will also show tourists the full wealth they will find in this region – which is so much larger than Paris!” stated Valérie Pécresse, Greater Paris Regional Council President. SNCF is a global leader in passenger and freight transport services, with revenue of €31.4 billion in 2015, of which 33% on international markets. With 260,000 employees in 120 countries, SNCF draws on its foundations in French rail and on its extensive experience as an architect of transport services. It aims to become the benchmark for mobility and logistics solutions, both in France and worldwide.